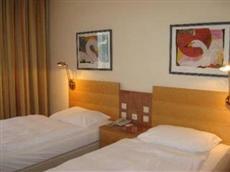 The Austria Trend Hotel Mitte Salzburg is located approximately twenty minutes from the city center. This three-star Salzburg accommodation is in close proximity to shopping and several restaurants. The main points of interest, such as the Mirabell Gardens, Mozart's birthplace, the Hohensalzburg Fortress, and the festival halls, are all a short bus ride away. The Salzburg airport is within close proximity of the Austria Trend Hotel Mitte Salzburg. Public transportation is plentiful, and a bus stop is located just in front of the hotel. Most sightseeing tours offer shuttle service, and the city offers several bicycle paths. There are ninety-seven guest rooms in the Austria Trend Hotel Mitte Salzburg, each offering high-speed Internet, cable flat screen televisions, telephones, alarm clocks, and in-room safes. All rooms have an en suite bath with hair dryers and complimentary toiletries. This modern, newly built hotel offers several amenities. A 24-hour bar offers drinks and light snacks, and breakfast is served each morning in the breakfast room. For business travelers, there is a complimentary business corner with high-speed Internet access. Guests are free to relax in the sunny atrium at the Austria Trend Hotel Mitte Salzburg. On-site parking is available.